The Education Committee of the BSD in conjunction with the Special Interest Groups (SIGs) has a Core Curriculum of courses that it has developed to ensure high quality dowsing instruction and to make sure that each student who takes these courses is exposed to roughly the same material (the Core Curriculum). As the same time, we have instituted a Tutor Training program to bring all Core Curriculum teachers up to speed as to what we want to be taught and how we want them to plan for their courses in conjunction with some excellent teaching techniques taught by an outside expert. One thing that we are adding to our overall curriculum – especially with the entry level courses – is a major focus on water. It is an essential skill for all of us in the BSD given the present shortage that we are experiencing here in Britain let alone in the rest of the world, and water is also an integral part of many of the other Special Interest Groups as well. The EEG is the first SIG to set up a series of graduated Core Curriculum courses. In February 2003, we offered our first Earth Energy entry level course, and gave it again this past February. We will be offering it every year at least once. This past June, we offered the second level of EEG courses -. Power Centres and Sacred Space. In order to take this course, ideally, each student had taken the EEG entry level course to qualify them for this weekend. Or, if participants could confirm that they have been doing EEG related work for two years and already have the skills listed in the entry level course, they could also take this course. The issue here is that we do not want to have these more advanced classes held back by one or two students who are not up to speed. Sig Lonegren tutored “Introduction to Power Centres and Sacred Space” at the Antrobus Arms Hotel in Amesbury, Wiltshire. We chose this location as it was so close to Stonehenge, which figured importantly in the course, as we shall see later. There were a number of different topics covered on Saturday including a brief review of the EEG Entry Level course. This was followed by an intro to archaeoastronomy. This is perhaps, the most difficult of all topics we covered in the weekend and it was not be possible to cover all the aspects of this arcane subject. Fortunately, Sig has developed a simple device called “the Sunfinder” which students can use to either check possible solar alignments at ancient sites or to align new sacred spaces to a particular sun rise or set for any day in the year. (See http://www.geomancy.org/sunfinder/). After lunch, we moved in to sacred geometry. This is a subject which one can NOT learn using only the left brain. You have to do it with your hands using a pair of compasses (a circle maker), a straight edge, pencil and paper. We got as far as seeing the five basic shapes – the circle (Π), the square (√2), the vesica piscis (√3), the double square (√5), and the phi (ø) rectangle. We also began to draw circles and the vesica piscis using a pair of compasses. Like astronomy, this was only an introductory taste of the sacred geometry found in sacred space. We then moved on to constructing new sacred space, and the various options one had including an understanding of the importance of the Four Directions and the role of dowsing in the location and orientation of these new spaces. On Saturday evening, we began a more meditative session with finding one’s spirit guides. This is actually something that will become much more important in the third level EEG course dealing with Geopathic Stress, and it is felt that students need to have been working with their guides for a good while before taking this course, so they were introduced to them now. We also did a guided meditation as to what each of us were looking for at this time of (just before) the Summer Solstice, and talked about the plans for tomorrow. 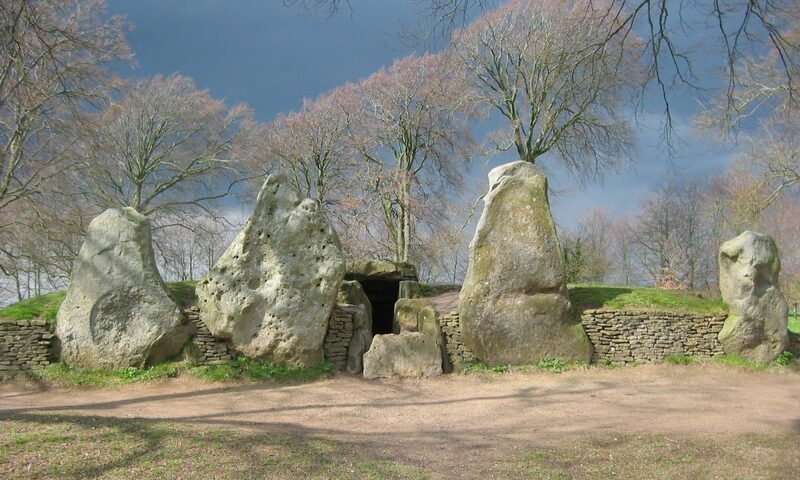 We have obtained a special access permission from English Heritage to enter in to the very centre of the stone circle, and to have it to ourselves for dowsing, observation and ceremony. 3:30am – Our BSD Accountant and course assistant Sylvia Cahill phoned each of our rooms very early to wake us up for the trip to the centre of Stonehenge and a possible the chance to see the sunrise near to the Heel Stone. The sun dramatically slows down its rising movement along the horizon the closer it gets to each solstice. On the 12th of June, it would be less than a half a degree from its Summer Solstce maximum azimuth (degrees from True North in a clockwise direction) of 50.79º at the latitude of Stonehenge. 4:40 am – We enter Stonehenge and have a look around the massive trilithons and Prescelly Blue Stones and begin to dowse. 4:52 am – The official time sunrise – NOT. It was quite cloudy along the northeastern horizon, and we only saw the sun about ten minutes later through the trilithons when it had risen a bit above the horizon. After the ceremony to find out what each of us could learn about how the Summer Solstice would effect us, and some more dowsing, our time in the centre ended, and we left the circle to go up to the Cursus and the round barrows that ran along side it. The ley starts at the first round barrow we came to at the edge of the Cursus. we could dowse the builder’s intent to put it in alignment with the henge of Stonehenge, Old Sarum and Salisbury Cathedral, but there was not an energy ley (six to eight foot wide beam of yang energy with a direction of flow) flowing concurrently along this ley. After walking to one end of the Cursus, we went back to the hotel for breakfast and a review of our time at Stonehenge. Everyone thought that it was a truly magnificent experience. We then went out on the back lawn of the hotel and dowsed the best place for a temporary new sacred space. After driving a wooden stake into centre, as it was daylight, and could not have an exercise of drawing down the North, we used a compass and corrected for magnetic deviation to find where to put the pole that would mark the North. We then used string to find South, and a Druid’s Cord of thirteen knots to find East and West. After lunch, we looked at the BSD Code of Ethics as it pertains to dowsing in Sacred Space, took down the new sacred space we had just made, completed evaluation forms and passed out Course Completion Forms. As a Tutor, the most important thing that I learned is of the importance of having different Tutors teaching the different levels of the Core Curriculum. Each dowser “sees” intangible targets differently, so it is important for students to have different Tutors. This will happen next year when different Tutors will be teaching EEG Level I and Level II classes. This leaves us with EEG Level III. At the moment, Sig and Patrick MacManaway will be teaching the EEG Geopathic Stress Course. It is your author’s opinion that this is the most difficult and potentially dangerous material that dowsers can encounter. Therefore, to take this course, students will have had to take the EEG Level I and II courses, or be able to present clear evidence including a letter of reference that supports their claim that they are both familiar and competent in material covered in these two courses and have been regularly dowsing at an intermediate or advanced level with this SIG’s material for at least five years. This article began with a discussion of the importance of quality teaching and continuity materials in the area of dowsing. Each of our Core Curriculum Courses is designed to build on the previous one, and each new course requires evidence that the participant has incorporated the knowledge and abilities gained in the previous course. At the moment, the Geopathic Stress course will be the culmination of the EEG Core Curriculum courses. The Introduction to Power Centres and Sacred Space was a second step along the way.